* Jane McKnew -- head of household, owns home with mortgage, female, white, age 72, widow, unknown immigration year, unknown citizenship status, able to read, able to write, born in Australia, mother tongue English, father born in England, mother tongue English, mother born in England, mother tongue English, can speak English, no occupation. 1920 United States Federal Census, San Francisco County, California, population schedule, Assembly District 26; Enumeration District 116, Page 10A, Dwelling #62, Family #93, Jane McKnew household, online database with digital image, Ancestry.com (http://www.ancestry.com : accessed 12 September 2007); citing National Archives Microfilm Publication T625, Roll 135. While Jane is enumerated in the house at 4137 19th Street in San Francisco, her family is probably nearby, but is not next door. This page of the enumeration is a "catch up" for missed persons. 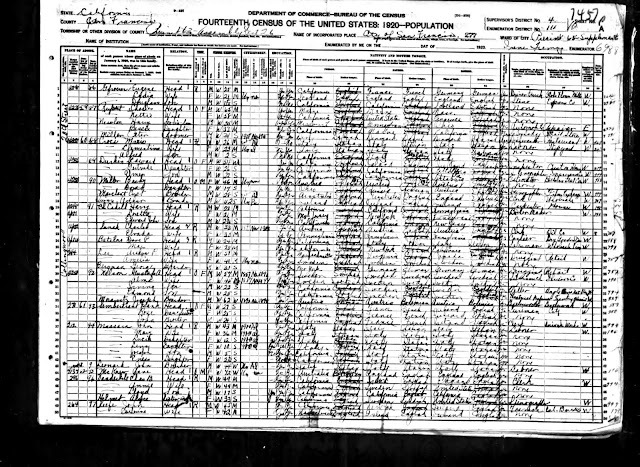 This is the last entry for Jane in a census record - she died on 7 February 1921. Her death certificate shows that she died at 1288 30th Avenue in San Francisco. Perhaps that was the home of one of her children or a convalescent hospital. Jane (Whittle) McKnew was my wife's great-grandmother; her grandmother is Edna Catherine (McKnew) Schaffner (1884-1974), who married Paul Frederick Schaffner (1879-1934) in 1906 in San Francisco.